Shubh Vivah Muhurat is listed below for the year 2017 and 2018 calculated based on Hindu calendar “Thirukanitha Panchangam”. Many factors are considered in determining auspicious wedding marriage dates. The Panchang (“Hindu calendar”) is used to calculate auspicious Hindu wedding dates. The Panchang is an important thing which is considered Day, Time, Lagna, Nakshatra and Tithi for choosing the date for any auspicious events. 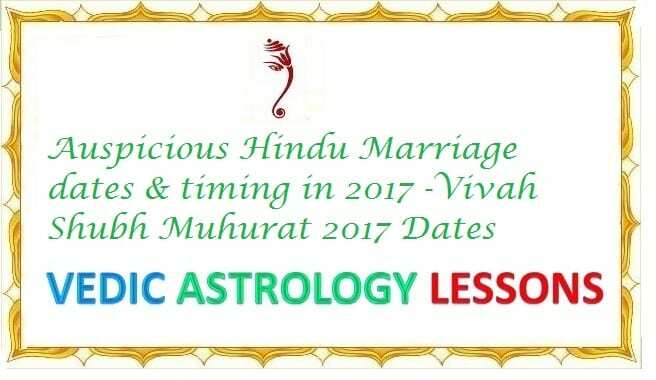 Here is a list of Auspicious Hindu Marriage dates & timing in 2017, Nakshatra & Tithi for the year 2016. The Auspicious Hindu Wedding Muhurat is listed below for the year 2018 calculated based on Hindu calendar “Panchanga”. The Auspicious Day, Tithi, Nakshatra, and Lagna are counted as below to choose auspicious dates for Wedding Dates. The day of the marked date should be event day when counts from the day Sunday. The Tithi of the marked date should be event day from Pithamai to Tithi. The Nakshatra of the marked date should be event day from Ashwini to Nakshatra. The Lagna of the marked date should be event day from Mesha (Aries) to Lagna. Here is a list of Auspicious Hindu Marriage dates & timing in 2018, Nakshatra & Tithi for the year 2018.